What do you do when your calm and cool horse doesn’t want to move out at the trot or canter? Resist the urge to peddle and make sure your horse will listen to your cues. 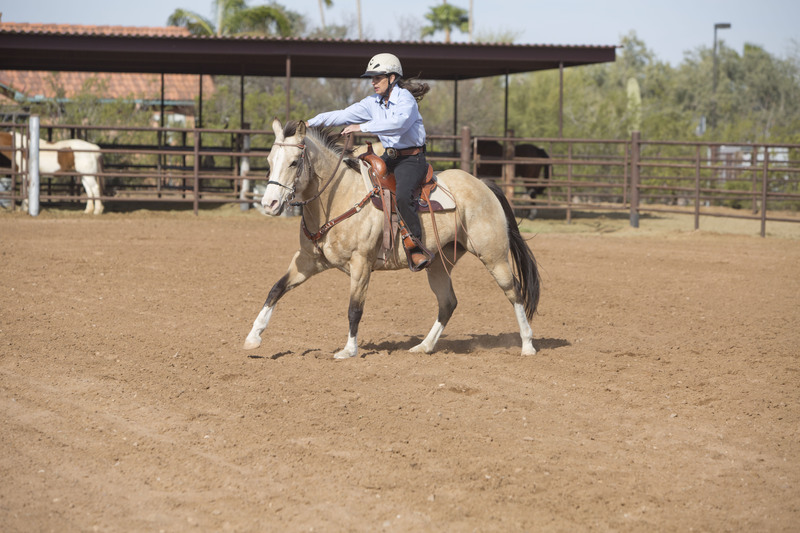 Find out how Julie helped this rider work with her slow and steady horse—first ruling out pain then making sure the horse follows her leadership. It sounds like your horse is resisting forward movement. There are two types of horses: the ones with too much whoa and the ones with too much go; you find that depending on the horse you must always push-to-go or pull-to-whoa. You are blessed with a horse with too much whoa–which makes him easy to ride. That’s the good news. The bad news is that he will try to get out of work if he can. He would rather stand still or amble along at the slow and steady gaits. When he pins his ears and fusses, it is likely because he does not like the thought of working harder and he is protesting. That said, do make sure that you have his back evaluated and make sure that the saddle fits well—those factors can cause an otherwise willing horse to resist the speedier gaits. If they feel pain, they won’t want to move. Once pain and saddle fit is ruled out, you must work on his disobedience to move faster as a training issue. And even if he did start the resistance because of pain, he’ll need to know that he is expected to move past the pain memory once all is well. The canter has much more suspension (all four feet off the ground) than the trot (the walk has no suspension at all) and therefore requires a lot more physical effort on the part of the horse. He is okay with working at the walk and trot but the canter represents more effort than he is willing to put out. His hope is that by protesting (threatening gestures) you will not ask him to do that. I suspect there are some other areas where he might display this resistant behavior but maybe you have not become aware of this yet. One thing I would do is address this issue of obedience from the ground. I would put him in the round pen and put him through his paces and see if I could make him canter from the ground. Chances are, he will resist that as well. Use a stick and flag to apply mental pressure (by waving it) and ask him to canter in the round pen at your request. He may kick and resist, so make sure you keep a safe distance from him. Ask him to canter, enforce it with the flag, ask him to canter a few strides and then let him trot or walk. There is an old saying in horsemanship that says, “All of training occurs in transitions.” It is not so important that he canters around the round pen ad nauseum, but that he obediently picks up the canter when asked. As soon as he appears to be cantering without resistance, go ahead and let him trot or walk, even if he has only gone a few strides. Also, working from the long training lead, you should be able to move the horse around you in a circle at the trot (it is too small a circle to ask him to canter) without any resistance from him. You will have to use a long lead. I use a rope halter and 15-foot training lead for this type of work (available at JulieGoodnight.com). Use your flag to help you move the horse out in a circle around you. This is similar to longeing a horse and it helps if you have previous experience doing this. It is important that you stay behind the horse’s balance point (girth area) and drive him forward and away from you. Many people have trouble driving a horse away from them because they try to lead him in a circle or they stay in front of the balance point. You have to stay behind the balance point to get a horse to move away from you. Once the horse will move out willingly in the round pen and on the lead line, he should be more willing and more obedient when you are riding. Be prepared to enforce your cue to canter with a crop or the tail of your reins if needed. While I don’t endorse whips for horses, reinforcing your horse with one quick tap is much better than constantly kicking him into the canter gait. If he learns he must follow your direction, you won’t have to constantly kick in the future. Another concept in horse training is “Ask, Tell, Command.” This means that you ask once lightly and politely, then tell with a reprimand. Usually with a lazy horse I go right from ask to command because they will take every opportunity you offer not to do the work. He will learn the sequence quickly then not need a command in the future. The most important thing is that you reinforce your cue and do not ask, ask, ask, and ask; which only serves to prove to the horse that you do not really mean what you say and that there are no ramifications if he does not respond. Make sure that when you ask him to canter, you are giving an adequate release of the reins, so that you are not contradicting your signal and giving him a legitimate reason to complain. When a horse canters, his head drops down with every stride. Often riders do not give an adequate release when they cue the horse to canter and the horse tries to pick the canter up, drops his head into the bit and stops. This is very frustrating to the horse and is a good reason for him to resist. Reach your hands toward his ears and give him room to move forward. Once you have asked the horse to canter and he does, wait until he is cantering willingly, relaxed and forward before you ask him to stop. Do not canter to the point of diminishing returns. All of training occurs in transitions, so it is the asking and the compliance that causes positive training, not how far or how long you canter. Good luck! I have a friend whose horse is refusing to canter lately. From my limited observation, I feel it is either ill-fitting saddle and rider nother giving enough release. I will share this article and see what happens. I will check his back for soreness first. Very nice, well behaved older QH gelding but rider lacks skills needed and becomes fearful at faster gaits. Thank you for this onformation. I am going to try it and see what happens.